The reviewer has been compensated in the form of a Best Buy Gift Card and/or received the product/service at a reduced price or for free. This post contains affiliate links and the reviewer will receive a commission if you click on a link and make a purchase. Television technology is every evolving and it seems like once you finally upgrade your old set, something even better comes along. It is kind of a double edged sword isn't it? I love seeing the new advances but I hate that I can't keep up! But the tech-loving geek in me wants to see and absorb it all so I am always eager to learn what is the best of the best. Right now the latest and greatest technology is 4K Ultra HD and Best Buy is giving you a chance to see it first hand and maybe even win one! 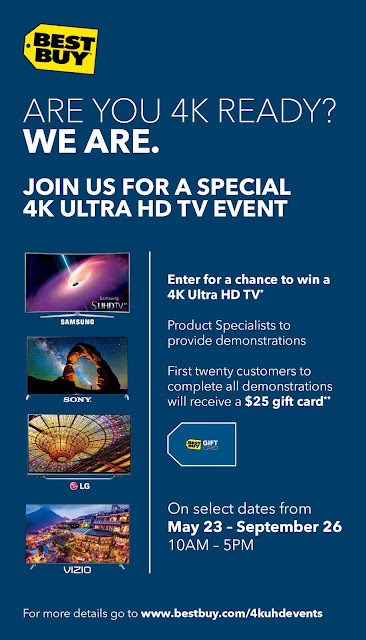 4K Ultra HD events are taking place in 50 Best Buy stores across the US from 5/23 through 9/6. Visit www.bestbuy.com/4kuhdevents for locations and more details. Product Specialists from Samsung, Sony, LG, Vizio, Sharp will be in the stores to provide demonstrations and help you to experience and learn about 4K Ultra HD. While in store, enter for a chance to win a 65" or 70" Class 4K Ultra HD TV! The first twenty (2) customers to complete all demonstrations will receive a $25 Best Buy gift card! Will you be heading into your local store to check it out? Sadly there aren't any happening in my area, but I plan on going in anyway just to take a look.